(left) a still from Maritess vs. the Superfriends, and (right) Bong Ja-Lee from How to Make Kimchi According to My Kun-Uma. This short film collection spotlights the work of eight Asian American filmmakers who previously screened their films for the Slant: Bold Asian American Images Film Festival. The content of this anthology runs the gamut from thought-provoking to hilarious to just plain weird, but overall, this is a fascinating window into the world of Asian American filmmaking. Slant, Volume 1 collects eight short films hand-picked from seven years of Aurora Picture Show’s annual Slant: Bold Asian American Images Film Festival. Since its inception in 2000, the festival has spotlighted the work of emerging Asian American filmmakers interested in breaking stereotypes and exploring subjects unavailable to them when working on mainstream projects. Like in any anthology, the eight films included in this collection are a mixed bag, but there’s enough quality material here to make Slant an omnibus worth checking out. The first film in the set, Daniel Hsia’s How to Do the Asian Squat, is a tongue-in-cheek mockumentary about the seeming propensity of Asians, particularly males, to squat whenever they are waiting around. Presented in faux-World War II era, black-and-white newsreel footage, the film elaborates on this comic observation to much amusing effect. The next film, Kip Fulbeck’s Lilo and Me, is an occasionally funny and poignant, recollection by the filmmaker about growing up as a mixed race child with no proper role models. The best bits of this short involve interactions with his own mother and father, particularly the comically sweet, sometimes befuddled messages they leave on his answering machine. Despite these charming qualities, Lilo & Me has a fundamentally flawed premise. The overarching conceit is that Fulbeck “grew up” with Disney films, which occasionally featured ethnically ambiguous characters that he felt he resembled (and, jokingly, also feels he deserves royalties for). The film then proceeds to list off these visually similar characters and juxtaposes them with actual pictures from Fulbeck’s own life. It’s an easy way to get a laugh, but if the viewer actually stops to think, this personal anecdote-turned-joke is really a sly misdirection in order to get cheap laughs. Aside from The Jungle Book, Fulbeck couldn’t possibly have grown up with any of the cartoons he mentions. He’s too old! The release dates for Pocahontas (1995), Mulan (1998), Lilo & Stitch (2002) make Fulbeck thirty, thirty-three, and thirty-six during the initial theatrical runs of these Disney “classics” – he was hardly a child. The fact that none of these characters are “ethnically ambiguous” and that the fifth film he mentions, Spirit: Stallion of the Cimarron, isn’t even a Disney movie (it’s from Dreamworks), just goes to show how terribly forced his premise really is. And that’s a shame, because there are some interesting issues that he’s attempting to explore. While Fulbeck’s film is able to elicit a few laughs, the third film in the anthology is, by far, the funniest. Entitled Maritess vs. the Superfriends, this animated short is adapted from Rex Navarette’s stand-up comedy act and envisions a scenario in which the Superfriends – Superman, Batman, Wonder Woman, et al – hire a Filipina maid to keep the Hall of Justice clean. Hi-jinks ensue thanks to a Man of Steel-turned-peeping tom, a Caped Crusader’s unseemly relationship with his underage sidekick, and the bitter feelings of inadequacy bubbling over from a certain marine-based superhero. Illegal immigration, superhero deconstruction, and cross-cultural comedy are just some of the high points of this raucous animated short. The accompanying audio was recorded from a live performance by Navarette himself, complete with audience reactions, a choice which enhances the humor despite the admitted rawness of the track. Also on the animated front is Lynn Okimura’s A Little Bit Different , which serves as a send-up of Sesame Street in cartoon form, as the audience is asked to name in sing-along form which onscreen character is “different” from the rest. After an initial question that proceeds as one might expect from such a format, the succeeding answers become progressively offensive at each turn. It’s a mildly amusing joke about cultural insensitivity, but too lightweight (and brief!) to leave any lasting impact. Similarly, Wes Kim’s Profiles in Science elicits a few chuckles, but doesn’t really have much of a “plot,” if that’s the right word. Presented as an aged documentary, complete with a damaged print (fans of Lost might liken the style to the Dharma Initiative training films), Profiles in Science focuses on Dr. Albert Chung, a scientist who theorizes that inanimate objects actually move when no one is looking. Using time lapse photography (actually stop-motion animation), he discovers the truth. The premise is somewhat “ho-hum” until Dr. Chung turns his attention to his “indolent offspring” – a lazy, couch-bound son who also seems to move when nobody’s around. Nobu Adilman’s I Pie (A Love Story) is by far the weirdest contribution to the anthology with its focus on a strangely shirtless, muscle-bound baker (Mio Adilman) who has an unhealthy obsession with pies. There’s little to praise in this creepy, altogether baffling misfire. Luckily, the real triumph of the anthology comes next. The longest film in the collection, How to Make Kimchi According to My Kun-Uma by Samuel Kiehoon Lee, purports to be just what its title suggests – a how-to documentary about a Korean staple. However, as Lee follows his subject (Bong Ja-Lee), other narratives begin to unfold involving the state of Koreans in Canada and concerns about the second and third generations’ loss of their “mother tongue” in a new national context. Further, the film serves as a funny send-up of the documentary form as Lee often continues to film his Auntie without her knowledge, leading to some funny, unguarded moments. For example, when Bong Ja-Lee takes her nephew to the Korean grocer, she talks about each key ingredient and puts them in her shopping cart for presumably future use. However, once she thinks that the camera is no longer on, she puts back a number of items, telling her nephew that she’s already got some at home. Why not just show each ingredient at the house? The fact is that the trip to the grocery store makes for a more interesting environment, particularly in conforming to the conventions of “how-to”-style television program. 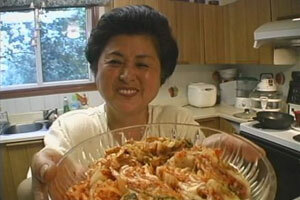 Ultimately, How to Make Kimchi According to My Kun-Uma is a fascinating, often hilarious achievement that is one part amateur cooking show and one part subtle exploration of what it means to be Korean in Canada. Sadly, Slant doesn’t end on a particular high note, as the final film in the anthology is less an actual film than a live-action interpretation of a slam poetry reading. As such, your mileage will vary on the qualities of Slip of the Tongue. Directed by Karen Lum and adapted from a live performance by Adriel Luis, the film centers on a man (William Chang) trying unsuccessfully to hit on a woman (director Lum herself) at a bus stop. Before he knows what hit him, this unsuspecting dope gets assaulted with a barrage of poetically inflected, motor-mouthed barbs touting Girl Power of the “I am Woman, Hear Me Roar!” variety. Do the cadences of spoken word poetry annoy you? Does a Bay Area Chinese American male delivering a message of female empowerment for Asian women everywhere seem kind of, well, silly? If you’re inclined to answer yes to either of those questions, Slip of the Tongue may not be for you. Although expertly edited and reflective of the poem it portrays, the film never registered with me. Like Maritess vs. The Superfriends, the audio comes from a live performance from a very appreciative audience. However, the source material’s message is pretty much tantamount to saying “Who hates racism?” or “You guys are the best audience ever” to a crowded room – in other words, an easy way to get applause.